My readers may have noticed these themes, as I am just starting to see them myself. • Each sign is a season and indicates how to be present to the energies and wisdom of the moment. • Being present to the energies and wisdom of the moment means I can make aware choices that support intention. • Each planet is an archetype that describes different parts of human experience and potential. They show us who we are and who we can become. Planets represent divine beings and may even be divine beings. They remind us that we are divine too. • Intention is how I both honor my divinity as well as take responsibility for my impact. • To live a life of intention means I am interested in manifesting change in myself and the world around me. • Even though I value intention and awareness, I also court paradox and the unknowable. The edge of Mystery is fertile with possibility. These beliefs motivate my astrology practice. I am most curious about intention and manifestation this month. Many of us believe that in order to manifest something, we must first work with an intention. That makes sense. But another assumption is often tied to this idea: Every intention should manifest if we are diligent enough, inspired enough, aware or smart enough to make it so. We judge ourselves when intention does not produce the change we are looking for. So, we get busy trying to figure out what we did wrong, who is to blame, and how to perfect our skills. However, I don’t think the purpose of working with intention is really about the outcome. Rather, it is about the practice itself, where it takes us on the inner journey, and the people it makes us into. Perhaps the practice helps us manifest change, but it also might not. Refreshing simplicity! What if we replaced shame about not manifesting our intentions with this awareness? Of course, we try our best to create the conditions that support our intentions—that is living in alignment—but we cannot control every factor. Living with intention without attachment to outcome. That’s a paradox for sure. The season of Virgo is a perfect time to notice our practices, intentions, and attachments to outcome. This mutable earth sign cultivates, discerns value, harvests, and disperses the benefits of practice. The gift of Virgo is steadfast attention to what we cultivate through ongoing attention to detail. The burden for Virgo is to be overwhelmed with managing those details. This is a sign that rides the edge of practice and manifestation. Like all Earth signs, Virgo is concerned with what really is, really here, being manifested right now. And Virgo probably is the sign most likely to hold itself to perfectionism—a deadly trap for working with intention. Every sign has a shadow and the genius to transform that shadow. The work this month is to notice how we hold ourselves accountable for intentions that have not yet manifested. We will be able to use Virgo eyes to pay attention to every nagging doubt and Virgo steadfastness to allow those doubts to fall away. If our practice this month is simply this, the transits will be new opportunities to observe and allow. Sometimes supportive, sometimes illuminating, sometimes challenging, each step in this month’s starsdance is another reminder that we are here with a reason to be. 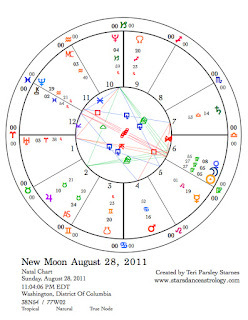 An important feature of the New Moon chart is a Grand Earth Trine, appropriate for the theme of intention and manifestation. A grand trine features a planet in every sign of a single element in harmonizing aspect to each other. The harmonizing part is the theory but I find grand trines can be challenging because every expression of the element, the cardinal, fixed and mutable, is demanding attention. The potential of the grand trine is to have access to every mode of energy. The challenge is to allow that harmony to exist. Sometimes we are partial to one modality over another. Cardinal people like starting new projects. Fixed people challenge every change. The Mutable folks are more interested in what they can learn and want to move on to the next thing. A committee with all these types cover all the bases, but first we have to appreciate their different approaches. In this Grand Earth committee, Cardinal focus is held by Pluto who wants us to research the very beginnings of intention. What motivates us to desire a particular manifestation? What are the secrets, the psychological complexes, and the fears that lie at the foundation? Jupiter in Taurus holds the Fixed focus. Jupiter is strong at this time because it is stationary. If Pluto plants the seeds of manifestation, Jupiter is protecting them in the fertile, dark earth. Perhaps we need to wait a little while longer before we notice anything happening. Perhaps we need to invoke our faith that when conditions allow, intention will manifest. The Mutable focus in this committee comes from Sun, Moon and Venus in Virgo – a lovely trio. The challenge is to evaluate what our seeds of intention have produced without invoking the specter of shame. Whatever has grown from the practice of intention can be illuminating and meaningful. Virgo is capable of harvesting this meaning. This lunation also begins with Mars square to Saturn. This is very earnest energy. We are trying hard but may not feel very successful. In January Saturn stationed retrograde at 17° Libra, it turned direct in June and this month finally passes the point where it retrograded. I think of this as new territory. While Saturn has been moving through this portion of the sky, we’ve had ample opportunity to push past struggles around balance and relationship. Now, new Libra lessons will arise. Saturn is about developing mastery. What are your trying to master about living with others or about creating harmony in your life? Have you set intention in this work? 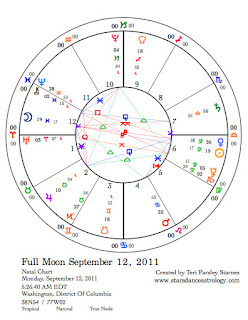 The Full Moon in Pisces provides an illuminating mirror for Virgo. Pisces reminds Virgo why focusing on intention is important in the first place. Pisces offers transcendence and meaning through the heart, giving balance to Virgo’s dry earthiness, which can get overly focused on work and results. 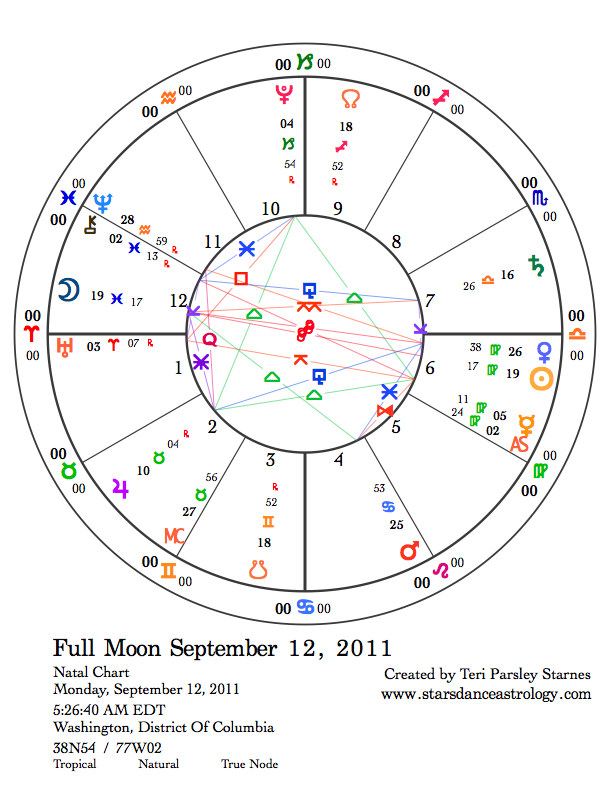 The Grand Earth Trine is present during the Full Moon too, this time with Mercury anchoring the Virgo part. Mercury rules Virgo and provides a strong desire to learn and be productive. 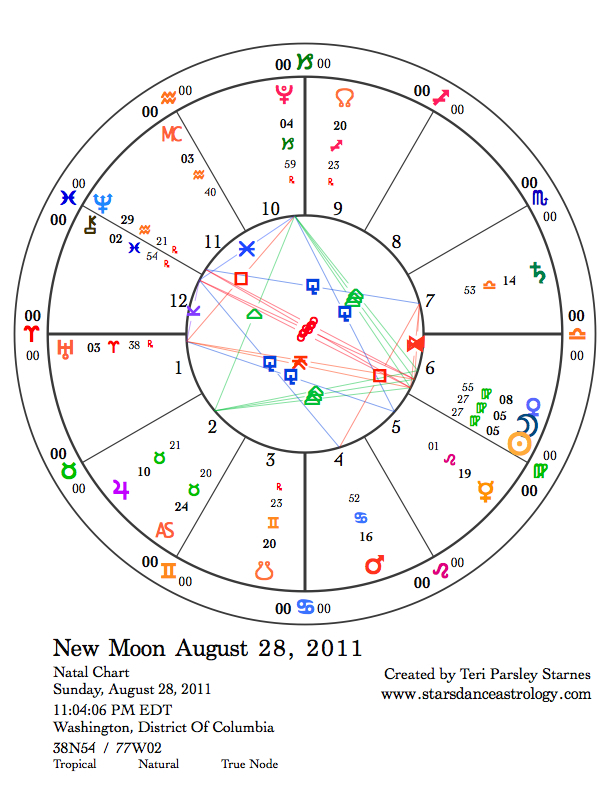 Mercury spent most of last lunar month retrograding through Leo after turning retrograde at 1° Virgo. When Mercury returns to that degree on September 9, it will be raring to go, eager to fulfill the Virgo mission of integration until this planet enters Libra on September 25. Virgo, as a mutable sign, is sensitive to energy and stress. The last half of this lunar month has the potential to be more stressful as there are several quincunx aspects between planets from September 16th to the next New Moon on the 27th. This is a good time to practice self-care, not discounting any stress we feel. The Hermit card in Tarot is a good guide for tending to Virgo stress. This card corresponds to Virgo in the Golden Dawn system. Sometimes we need periods of quiet contemplation, times to focus on intention and practice, and release ourselves from the expectations of success or failure. These times serve a purpose. We should honor them.